There’s going to be an increasing amount of chatter that this is the next bear market. I’m seeing analysts at major banks saying it has already started. I’ll admit, it looks a little worrisome out there. There are valid reasons to be concerned about the health of the decade-long bull market. It’s why I constantly watch indicators to gauge the market. And one of my favorite market-wide indicators is telling us not to sweat the current volatility. This indicator actually predicted it over a century ago. A special calendar I use says we are in a G year. These years are known for low stock prices, aka a correction. And that’s exactly what we saw. The calendar that I pull this data from goes back to the 1800s. It’s known as the 18.5-year market cycle. It’s predicted nearly every major move in the stock market. And it isn’t calling for a bear market until 2022. The calendar marks an 18.5-year cycle with 10 letters from the alphabet, A through K. Each letter denotes what we can expect around that given year. That’s why, when I saw a G beside 2018, I told you to expect volatility to surge. The calendar was spot-on. Here are the letters in detail. After G, the next letter on the calendar is an H. An H year tells us to expect “very high stock prices; most prosperous year; waste, overspeculation and extravagance. That’s a bold statement. But when you think about our current economy, we haven’t really hit that moment when this bull market seems unstoppable. We continue to climb a wall of worry. There are worries over trade wars, interest rates and the overall economy. It doesn’t end. Yet due to a few bearish indicators, like the one I showed on Friday, the market-watchers are only going to fuel this wall of worry. The 18.5-year market cycle is telling me to ignore them … for now, anyway. After H, the next letter on the calendar, J, shows up in 2022. That’s the letter to look out for. 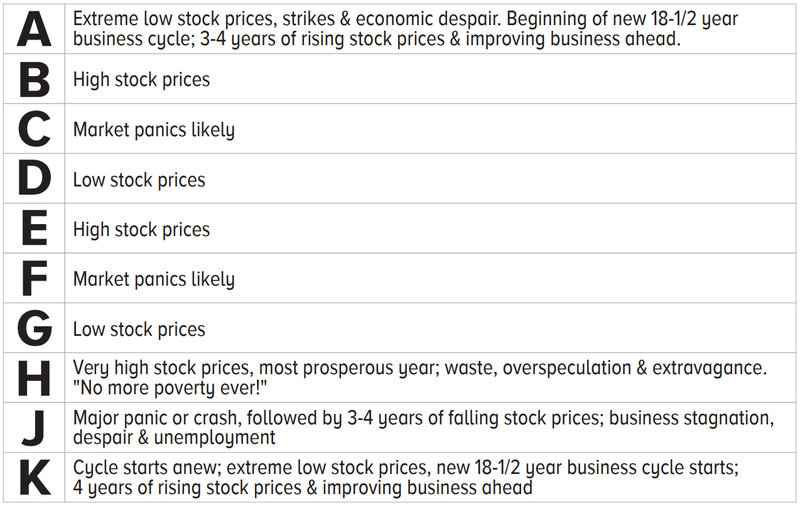 It signals that a major panic or crash will happen, followed by three to four years of falling stock prices. That’s the bear market everyone is looking for. It just isn’t here yet. So, over the next few years, we will continue to invest to benefit from a bull market. The strategies you have been using that took a step back in the volatile 2018 will come roaring back to life next year. Don’t give up on them just yet. At some point, we’ll need to flip the switch and look to profit from the bear market. But for now, keep buying the dips and implementing the strategies that have handed you much success in recent years. « Previous Will The Rivian R1T Lead the Electric Truck Revolution?